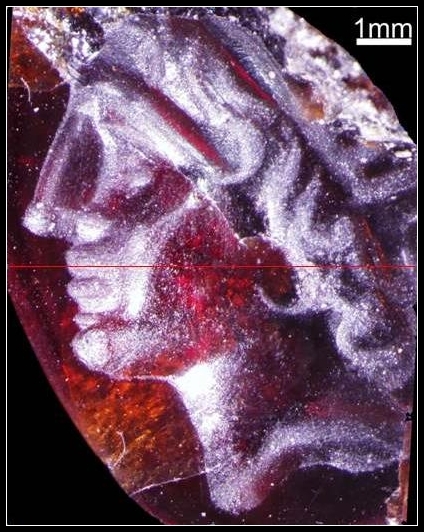 A magnificent miniature of Alexander the Great has been found during the excavation of Tel Dor, an ancient port city 30 miles south of Haifa, Israel. 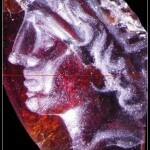 It was engraved on a gemstone less than a centimeter long and less than half a centimeter wide. Despite the teeniness of the medium, the artist carved the youthful Alexander in exquisite detail. Clearly this was a highly valuable piece even in its own day, something that is surprising given the location. You’d expect to find a treasure like this in the major centers of the Greek empire, not so much in Israel, although Alexander did take the ancient city (called just plain Dor back then) without encountering resistance on his way to Egypt in 332 BC. This is one of the reasons archaeological context is so important, btw. Not to flog my hobby horse or anything, but if this piece had been looted and turned up wherever without a record of where it was found, nobody would ever have thought it came from Israel. Now not only do we have this extraordinary piece of art, but we know something we hadn’t even considered about the time and place in which it was made. This entry was posted on Wednesday, August 26th, 2009 at 9:43 PM	and is filed under Ancient, Treasures. You can follow any responses to this entry through the RSS 2.0 feed. You can skip to the end and leave a response. Pinging is currently not allowed. Imagine finding something like that. I guess the red would jump out at ya. Unless it was caked in dirt. Then it would look like a wee pebble. Remember that Alexander went to Israel, to pray on the Temple Mount and venerate the Judaic god (according to Josephus – the propaganda expert). It could have been lost then. Well, Alexander and his army were actually in Dor in 332 B.C., so even if we sent aside Josephus’ fanciful account it’s still possible the gemstone was left behind by Greeks. I haven’t found any date ranges for the building in which it was found, except that it was from the Hellenistic period.